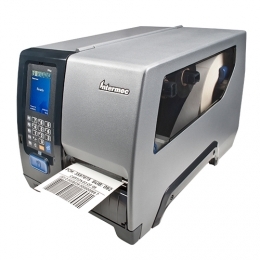 The mid-range label printers PM43 and PM43c from Intermec stand apart with their large performance spectrum, reliability and crisp print results, as well as simple integration. With their durable metal housing they are made for versatile usage in rough environments. Contact-free configuration and a clearly arranged touch control panel ensure for high productivity. With the optionally available RFID chip you further simplify processes. Max. print speed 300 mm/sec. Both printers are entirely network-capable. For this purpose use the integrated Ethernet port or optional b/g/n Wi-Fi for wireless communication. Thanks also to the optionally integrated Bluetooth module the PM43 and PM43c also reliably communicate with mobile and peripheral devices. Internal applications ensure the management of additional devices, making an additional PC completely unnecessary. A wide variety of interfaces give you the necessary leeway. The integrated web interface simplifies efficient device monitoring during operation. Label output occurs at a rate up to 300 mm per second. Even with high resolution printing at 406 dpi, the printers still reach a maximum speed of 250 mm per second.